Dubai has the first theme park in the world that is entirely dedicated to Bollywood, the Hindi-language film, video and TV industry from the largest city in India, Bombay (Mumbai). Bollywood Parks has something for everyone, from blockbuster attractions to extravagant live shows and from delicious Indian restaurants to dazzling attractions. 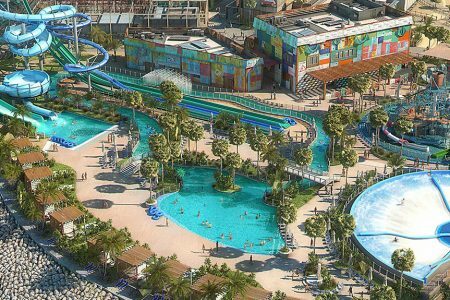 The brand new amusement park has a price tag of no less than 2.9 billion dollars and hopes to become the new attraction of Dubai. The park mainly targets tourists and guest workers from India, Pakistan and Bangladesh, where the Bollywood films are popular and the well-known Bollywood actors go through life as true pop stars. One of the attractions of the park is the theater, which is strongly inspired by the famous Taj-Mahal. The park covers an area of ​​157,000 square meters and is divided into five different zones: Rustic Ravine, Mumbai Chowk, Bollywood Boulevard, Royal Plaza and the Bollywood Film Studio. The park has also several restaurants where the Indian cuisine is central. Rustic Ravine takes you to the bustle of central India with the colorful landscape. In this area of ​​the park you will find a number of spectacular attractions including the Dabang: Stunt Spectacular Show, a show with lots of action, flying cars explosions and gunshots. In Rustic Ravine you will also find the attractions Lagaan: The Thrill of Victory where cricket is central, Lagaan: Champaner Cricket Carnival and the 3D attraction Sholay: The Hunt for Gabbar Singh where you have to try to get the highest score with a laser gun. The Rajmahal Theater is located in the Royal Plaza. This iconic landmark is the proud of Bollywood Parks and is located in the heart of the park. The design of this enormous theater is based on the royal palaces in India and of course on the world-famous Taj-Mahal. The theater has space for up to 850 people and is the first location in the Middle East where you can admire Broadway-style Bollywood musicals. The Rajmahal Theater can also be booked for wedding location, presentations and other events. Besides the Rajmahal Theater you will also find the Stars on Steps dance and song show and Mughal-e-Azam atrracties in the Royal Plaza section of the park. This area of ​​the park is a replica of a small piece of Mumbai, the birthplace of Bollywood and home to millions of Indians. In Mumbai Chowk you will find two attractions, Don: The Chase and the Mumbai Express. 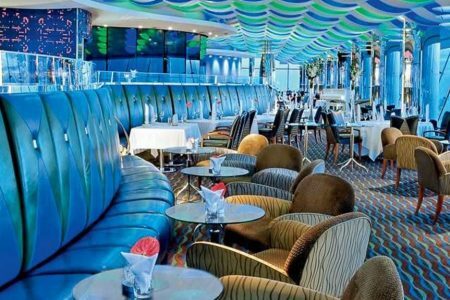 In Mumbai Chowk you will also find the Victoria Station restaurant which is completely dedicated to one of the most famous Mumbai attractions, the Victoria train station. Don: The Chase is a 3D attraction that takes you into the dangerous world of Interpol agents and goes on an exciting adventure as you speed through a tunnel. The Mumbai Express is a musical with dance, music and entertainment. The Bollywood Film Studio takes you to the streets of Mumbai with its cafe’s street vendors, shops and the Bollywood heroes. The attractions that you will find in the Bollywood Film Studios zone are the 4D RA. One attraction: Unleashed, the 4D Krrish theater: Hero’s Flight, Hall of Heroes with all Bollywood and Rangmanch heroes, an open air theater with numerous live shows. 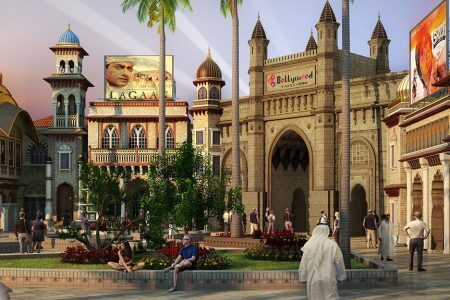 The new Bollywood Parks will become part of the new Dubai Parks and Resorts area where Legoland Dubai, the Legoland Waterpark with 20 water attractions, the Motiongate Dubai park where the film is central and Riverland Dubai are part of. Once all five parts of this huge amusement park have been completed, Dubai Parks is the largest amusement park in the Middle East. Next to the amusement parks, the project also includes a luxury hotel where you can relax between all the hustle and bustle of the theme parks. 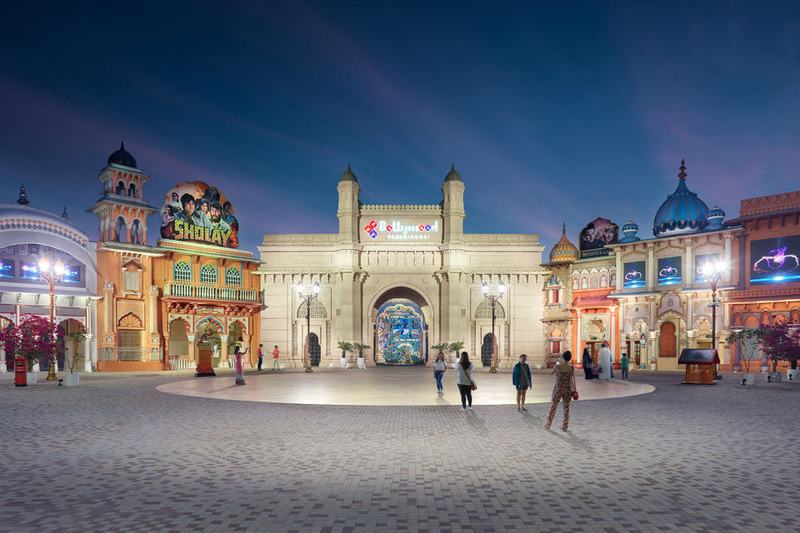 Bollywood Parks is located in the Dubai Parks and Resorts project, this extensive amusement park is located on Sheik Zayed Road, near Palm Jebel Ali and the Al Maktoum International Airport. Look for the exact location on the Google Maps map below. 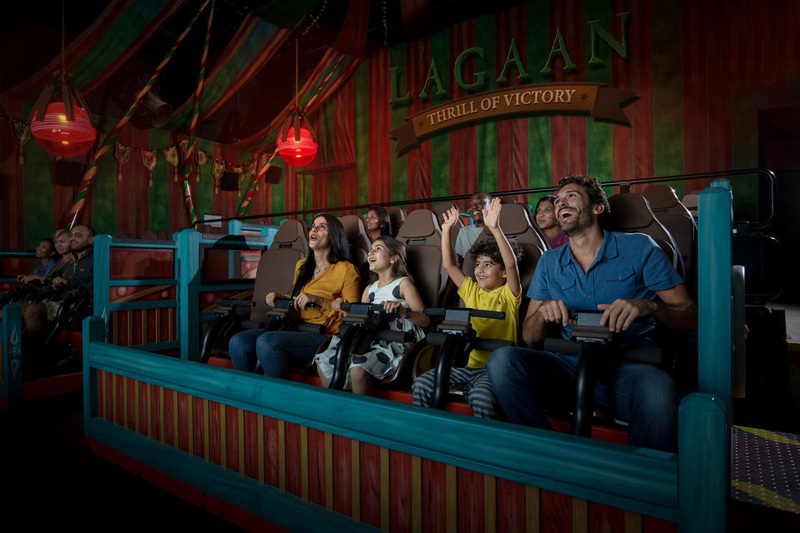 The Bollywood Parks amusement park offers various tickets, from a ticket for one day for the Bollywood park to a ticket for 4 days for several theme parks of the Dubai Parks and Resort. You can easily book the one-day tickets for Bollywood in Dubai online via the GetYourGuide website or the website of Tiqets. Prices start at 43 dollars for a ticket for Bollywood Parks only. 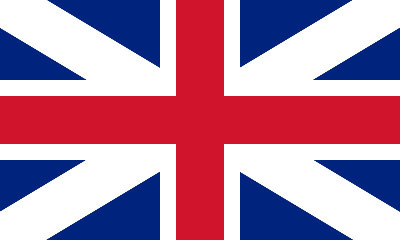 Do you want to visit two theme parks in one day? For 74 dollars you buy a ticket that allows you to visit 2 of the 4 parks of Dubai Parks & Resorts in one day. Would you like to visit the Bollywood Parks theme park for one day? Then the single park ticket is the cheapest option. If you want to visit Legoland next to the Bollywood Parks, the 1 day – 2 parks ticket is the cheaper option. The entrance for the Bollywood Park in Dubai is 43 dollars per person. The mentioned prices may have changed, for the current admission prices please refer to the website of the ticket seller. Click here to book the tickets online so you do not have to wait in line before you can start your day. With the “1 Day 2 Theme Parks Hopper” ticket you can visit two parks of Dubai Parks and Resorts in one day. For example, next to the Bollywood Park you can also visit LEGOLAND Dubai, Motiongate, Riverland or LEGOLAND Waterpark. Click here to book the tickets online so you don’t have to wait in line before you may enter the park. The prices start at 73 dollars for a ticket that allows you to visit 2 of the 4 parks of Dubai Parks & Resorts in one day. Visit all four parks in one day or visit all parks in two days with the special ticket for Dubai Parks and Resorts. A ticket for 2 days with which you get access to all theme parks of Dubai Parks & Resorts costs 129 dollars person. Click here to reserve the tickets online so you do not have to wait in line before you can start your day. Bollywood parks is open daily. Sunday till wednesday the park is open from 02:00 pm to 22:00 pm and from thursday till saterday the park is open from 02:00 pm till midnight. 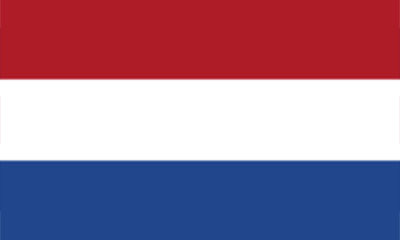 On December 31, the park is specially opened in connection with New years eve then the park closes at 03:00 at night. 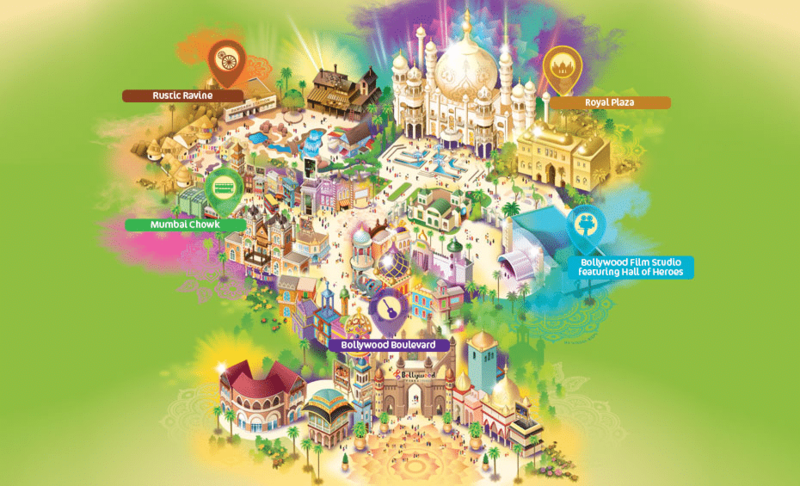 For more information about the Bollywood Parks theme park, visit the official website. If you are going to the Bollywood amusement park with your own transport you can park in five different places, each park in the Dubai Parks and Resorts complex has its own parking area. Everywhere you have to pay for parking, the costs are between 27 and 40 dollars. Check the Directions page on the website of the park for more information about the route to the park and the parking places. From the parking lots there is a free tram to stations on the complex. The trams leave every 5 to 10 minutes.